Safety is a huge concern for online poker players in the USA as well as players from around the world. We have seen a lot of poker sites come and go over the years. We are here to make sure that you can safely enjoy the game of poker online. The sites that we represent are all safe to play at. These sites are all licensed and regulated sites. These sites have the best encryption software available to make sure that your personal and banking information are secure. You will never have to worry about your information being disclosed to a third party. 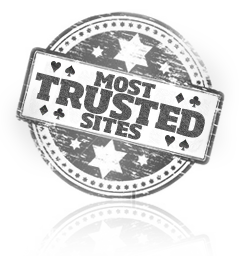 We have a comprehensive review of the safest USA poker sites. You can not only play safely at these sites, but you will also be well rewarded for doing so. We offer the best bonuses for the sites that we represent. Our players will also gain instant access to the very rewarding VIP Programs at these sites. If you like to take advantages of bonuses then you can continue coming back to this page after you have cleared the bonus at one site to sign up for the next site. Bonus clearing is an excellent way to increase your bankroll and help you to be a winning poker player. We want to make sure that all of our players can enjoy the game of poker online safely. This is why we have spent many hours researching the sites and handpicking the best sites for you. There are many things to take into consideration when you are deciding if a poker site is safe to play at. You should first see how long the site has been in business. I would be skeptical about depositing money in a new poker site unless it is affiliated with a long standing network. You should also look at the payout history for the poker site. If you are in the USA and currently playing online poker then you probably know that the payouts for US players have become slower since Black Friday. However, the sites that we represent will make sure that you are paid. It does take longer, but you will get your money. You should always research the site that you are considering playing at. There are clear warning sites if a site is in trouble. These warning signs include players not getting their cash outs after months of waiting. Be sure to carefully research though. Some players get aggravated after a few days of waiting and falsely state that they have been waiting for months on end. You can safely deposit and play at any of the sites that we represent. You can rest assured that your money will be safe at these sites. As we have already mentioned, players from the US can expect delayed cash out times, but the money will be paid from these sites.